A massive billboard highlighting the child's disappearance. The Phoenix SAPS have confirmed the discovery, which was made not far from the only suspect’s house. 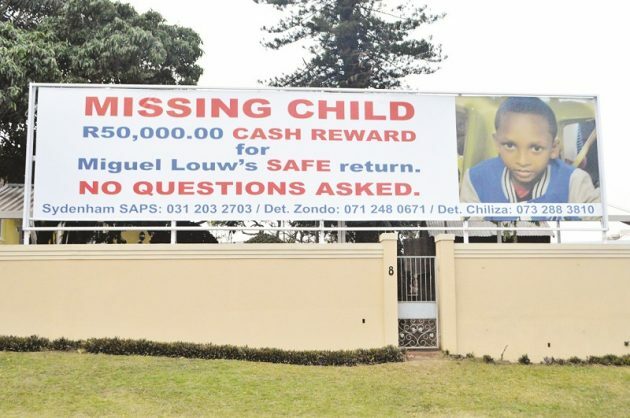 Longberry Drive in Phoenix was the site of a gruesome discovery when police and other authorities discovered the corpse of nine-year-old child Miguel Louw. Various reports have suspected that the body is that of the missing Sydenham pupil, who was last seen on July 17. When Rising Sun Overport sought confirmation from the communications officer of Phoenix SAPS, Cpt L Naidoo, he confirmed the discovery but could not share any further details about the incident, including the identity of the decomposing body. Times Live reports that the body was found by Glen Naidoo‚ the head of a private security company. One of the child’s aunts was reportedly in an emotional state at the scene, a park in Longbury Drive in Phoenix. A school jacket he was reportedly wearing the last time he was seen was linked to him at the scene, which has given investigators the confidence to positively identify the victim, and have shared that information with Times Live. Security officers apparently found the body while chasing robbers in a completely unrelated case. A gigantic billboard was erected in the area in the middle of last month offering a large reward for information. Miguel was allegedly kidnapped in July while returning home from school. A 43-year-old man has already been arrested and charged in relation to the crime.